An important function of the brains is the ability to store and memorize data: our memory. Neuropsychology distinguishes different types of memory in which different brain areas are involved. Damage to these areas in the brains can cause memory problems. This is memory of consciously accessible knowledge of facts. Examples include learn from your autobiography (called episodic memory), or that the Netherlands is in Europe (semantic memory). Examples include knowledge of your autobiography (episodic memory), or the knowledge that the Netherlands is in Europe (semantic memory). This portion of long-term memory is not consciously accessible and consists of skills, habits, and conditioned (learned) responses, which can be reflected by the reception of sensory information through hearing, smell, sight, taste and touch. One example is the ability to cycle or to use language. This portion of long-term memory is both consciously and unconsciously accessible. An example is: returning to a certain place evokes a good feeling in you since it is the place where you got your first kiss. A synonym for short-term memory is working memory. In the short term memory information like numbers, words and names is stored for a short time. Also, the short-term memory plays an important role in memory of sensory events and movements. An example where an appeal is made to the short term, is remembering the place where you left the coffee cup from which you just had coffee. When information is important enough, the information collected from the short term memory can be transmitted through to the long term memory, where it is stored for extended periods of time. A disorder that often occurs after brain injury is loss of memory or amnesia; a gap or hole in memory to a greater or lesser extent. The duration of the loss of memory or the ability to create new memories depends on the severity of the injury or disease and the location of the injury. Anterograde amnesia is the type of loss of memory where no new memories can be created from the moment of brain injury, while the person still can reminisce things that happened before the brain injury. Retrograde amnesia is the type of loss of memory where no old memories can be collected over a period of time, but from the moment of the brain injury new memories can be created. In the case of a concussion the loss of memory is less than in the case of a heavier brain injury. Often, in this case there is only retrograde amnesia. The brain is a complex network in which for each feature many different brain areas are involved. On the basis of studies in humans with brain injury it has become clear that a number of brain regions seem to have an important role in various types of memory. Explicit memory is associated with brain structures of the temporal lobe (fig. 1A1), including the hippocampus or perirhinal cortex (fig. 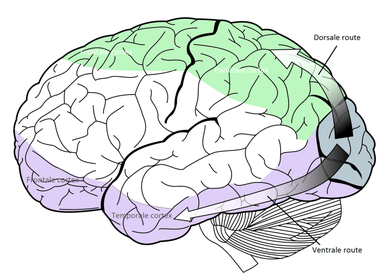 1A2) and connections to the ventral (lower parts of) the frontal cortex (fig. 1A3). Episodic (autobiographical) memory is mainly dependent on the lower portions of the hippocampus and frontal lobe cortex (ventral frontal cortex). Damage to these areas causes loss of all retrograde autobiographical memories and often anterograde amnesia. Also, diseases such as a certain type of encephalitis: Herpes Simplex Encephalitis, but also Alzheimer's disease and Korsakoff's syndrome are characterized by damage to the brain regions that are associated with explicit memory. Implicit memory is associated with the areas (neural structures) of the brain of the basal ganglia (Fig. 1B1), motor cortex (Fig. 1B2) and little brains (cerebellum) (Fig. 1B3). The limbic system is responsible for encoding emotional memories. In particular, the amygdala is involved. Also, many areas of the brain are involved in the short-term memory. Predominantly the sensory areas are involved in the transmission of information before it proceeds to the long term memory. 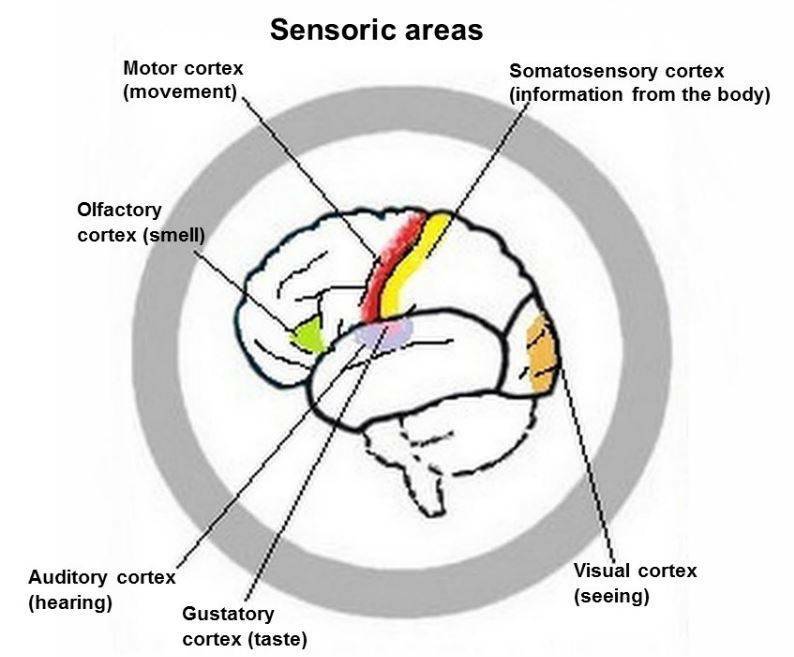 Sensory areas are the areas that are important in the perception of information from the senses; sight, hearing, smell, taste and touch. (Fig.1B2). Through these sensory areas the perception is, by means of repetition (imprinting), passed to long-term memory, where information is stored for extended periods of time. Especially the hippocampus plays a role in inculcating information. Damage to the hippocampus causes problems in inculcating information and to remembering things (anterograde amnesia). With regard to short-term memory more than one classifications are possible. One of the classifications of short term memory is the dorsal or ventral pathway to the frontal cortex. The dorsal route is for memorizing locations, for the short time, and runs through the top of the sensory regions (sensory regions) into the temporal lobe / parietal lobe to the frontal cerebral cortex (frontal cortex). That is the green route on the image below. (Fig.2). The ventral route is for memorizing objects, for the short time, and runs through the bottom from the sensory regions in the temporal lobe to the frontal cortex. That is the purple route on the image below. Limbic system (from the Latin word ‘limbus’); border = group of brain structures in the large brains that are involved in emotion, emotional memory, pleasure and motivation. It contains the hippocampus, cingulate gyrus, hypothalamus, amygdala, orbitofrontal cortex and septum pellucidum. Dorsal route to frontal lobe = The route for information through the top of the head to the frontal lobe, the front side of the head. It is for memorizing locations for a short time. Ventral route to frontal lobe = route for information via underside of the head to the frontal lobe in front of the head. It is for memorizing objects for a short time. Kolb, B., & Whishaw, I. Q. (2009). Fundamentals of Human Neurpsychology. New York, Worth Publishers.